You may have noticed that this year on the blog I’m trying to get back to sharing the small spaces in my home that I’m organizing each week. I’m not staging my photos and just keeping it real. However it can be so hard not to compare ourselves to the beautifully decorated homes we see on Instagram isn’t it? When scrolling through your feed do you ever find yourself thinking that your home can never look this nice or be that organized, so why should I even bother? I don’t want to perpetuate that problem which is why I don’t stage my photos. Last week I shared a picture of my kitchen on the blog. I didn’t take a single thing off my counters that isn’t normally there. What you saw is exactly what my friends see when they come over to visit. After that post I got a comment thanking me for sharing a real kitchen (outdated oak cabinets and all) and it made me so happy. Yes this is my real life that I’m sharing and I do so hoping that it encourages others. My goal in helping others organize isn’t so you have an Instagram worthy home that showcases well in pictures. Instead I want to help you have a peaceful organized home that lends itself to calming the chaos in your life. 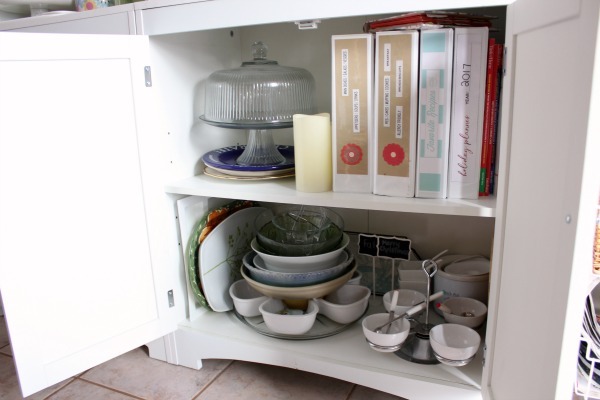 It can be done, one small organized space at a time. This week I’ve been working on switching out some of my winter decor for spring accessories. I’ve had enough of winter and I wanted to lighten things up with some spring colors even if outside tells an entirely different story. Anyway when I opened my linen cupboard, which is in a hutch in my dining room, this situation presented itself. Not terrible but the place mats I wanted to access were at the bottom of that pile. I could have grabbed them out and hoped for the best but I had a pretty good idea that the entire pile was going to come crashing down as soon as I tried to get them out. So I instead took everything out and dumped it on the floor. I knew that I no longer needed half of those linens. I rarely use tablecloths anymore and most of them didn’t match the new color scheme of my kitchen/dining room since we painted last year anyway. It was a lot of decisions that needed to be made, so in all honesty I’d been putting it off for awhile. But now was the time to get it done. With everything lying around me I created two piles, one for keep and one for donate. I just started tossing things in to whatever side they fit. I asked myself questions like when have I used this last and what are the chances I’d use it again. Anything not used within the last year was donated. As you can see that turned out to be a pretty big pile. In our old house when we lived near family and had much more space. I use to do a lot more entertaining back then than I do now. I loved decorating the table for whatever holiday was upon us. Now I rarely entertain and never large crowds since our space is so much smaller. So it just wasn’t realistic to continue to hoard all these things that haven’t been used in years. They represent a different life. Quite honestly these things made me sad to look at remembering how awesome it used to be living in the same town as family. I don’t have that luxury now (nor do I have a big dining room anymore) so we are just in a different stage of life. I still set special holiday tables for my immediate family but on a much simpler scale. Keeping things simple I’ve come to realize over the years can also be beautiful. My cupboard is so much lighter now and I am too. Living in the present and not holding on to things that represent a different time is my goal. It doesn’t make sense to have to dig through stuff I rarely use to find the things I do use and love regularly. I don’t want my home to be a storage space for days gone by. Instead I want a home that represents and serves the stage of life we are in now. I love the feeling of freedom that comes from living in the present and not for “just in case”. 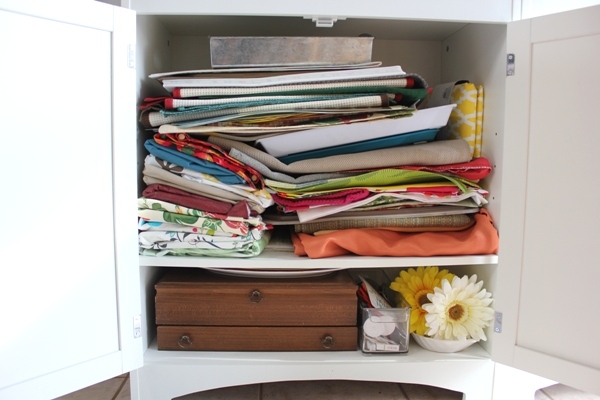 Where do you keep your linens? 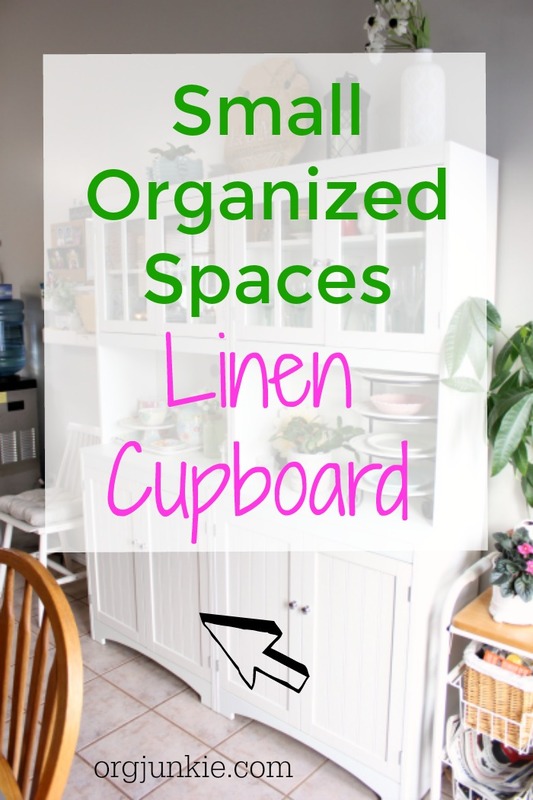 Do you have a linen cupboard? Have a great weekend everyone! 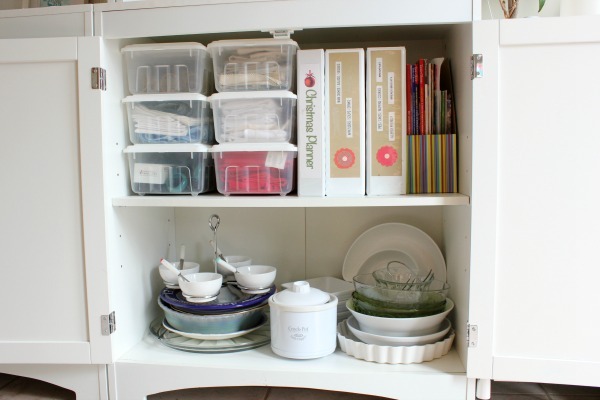 I hope you take some time to create a small organized space in your own home. I have a closet in my upstairs hallway that is dedicated to storing towels, bedding etc. Time has taken its toll, though. Looking at your work inspires me to get with the plan and straighten it all up! I have been slowly cleaning out my closets and parting with things I haven’t used. Looking at what you did will give me some inspiration to tackle my kitchen. 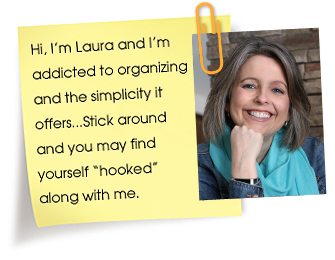 Laura, Your sentence “I don’t want my home to be a storage space for days gone by” really hit me in the heart. I am slowly purging my house with the goal to sell and downsize to a smaller house. You have given me such a boost, you’ll never know! I’ve just had a much needed attitude shift. I need to stop the pity party about the life I used to live and get on with welcoming the new! Awe so glad I could help!! I’m so excited for you and your future free of the clutter that holds you back, yay! That’s why I love your Instagram, Laura, it’s REAL! 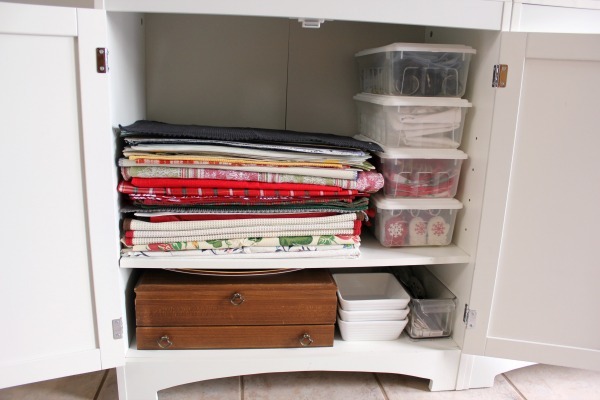 I keep tablecloths and some placemats in my sideboard but I have so many placemats, I also keep some in our hutch and in one of my kitchen cupboards. And actually I’ve been thinking about your Instagram post for days – about how things don’t match your new home. My current diningroom has a lot of facebrick so I really only want to use bright colours. I have a brown tablecloth that definitely needs to go and a couple of runners and (lots of) placemats too! I’ll put it on my list for the weekend to go through that pile! 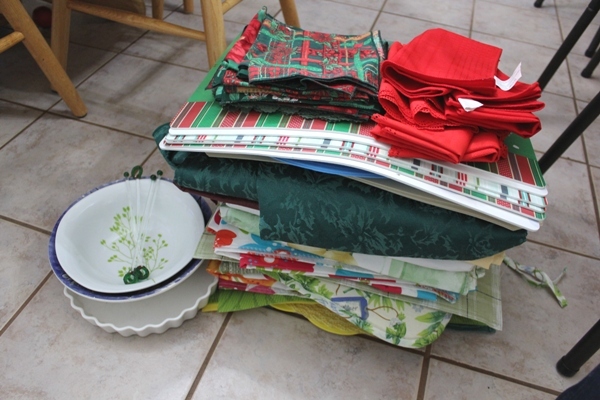 I keep the few tablecloths and napkins I have, in my living room. We have a secretary which we used to use a bar – better than 99% for soda, rare anyone who came drank alcoholic beverages – when we used to have people in. The 2 drawers under had the linens in one and some serving pieces in the other. The top shelves hidden behind green fabric in the door held the barware and our (relatively) good glasses. I have been getting rid of the barware and moving the good glasses to a kitchen closet (room made by getting rid of stuff from same) to make more room for husband’s every expanding DVD collection. I have a tiny drawer and a half in the kitchen for kitchen towels. Towels for downstairs bathroom are under the sink and there is a plastic bag of old towels for messy cleanups in the basement. I have a linen closet in my upstairs hall which has the 2 sets of sheets/pillow cases for our bed as well as the towels to go in the upstairs bathroom. All fit on 2 shelves in this closet and the rest of the space is used for additional bathroom storage as we have almost none in either bathroom and related items. The spare bedroom has one set of sheets which is kept on it – the bed has been used 3 times and the sheets washed and put back each time.